Faux leather gilet lined with faux sheepskin. 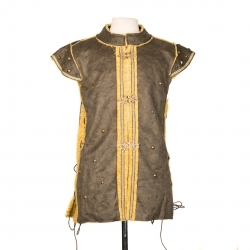 Both warm and attractive, this gilet features gold-coloured stud detailing on the body and sleeves, decorative metal clasp fastenings, and adjustable laced sides. 32" length from shoulder, 20" width across shoulders, adjustable width across chest. Faux leather gilet lined with faux sheepskin. Both warm and attractive, this gilet features silver-coloured stud detailing on the body and sleeves, decorative metal clasp fastenings, and adjustable laced sides to fit all sizes. 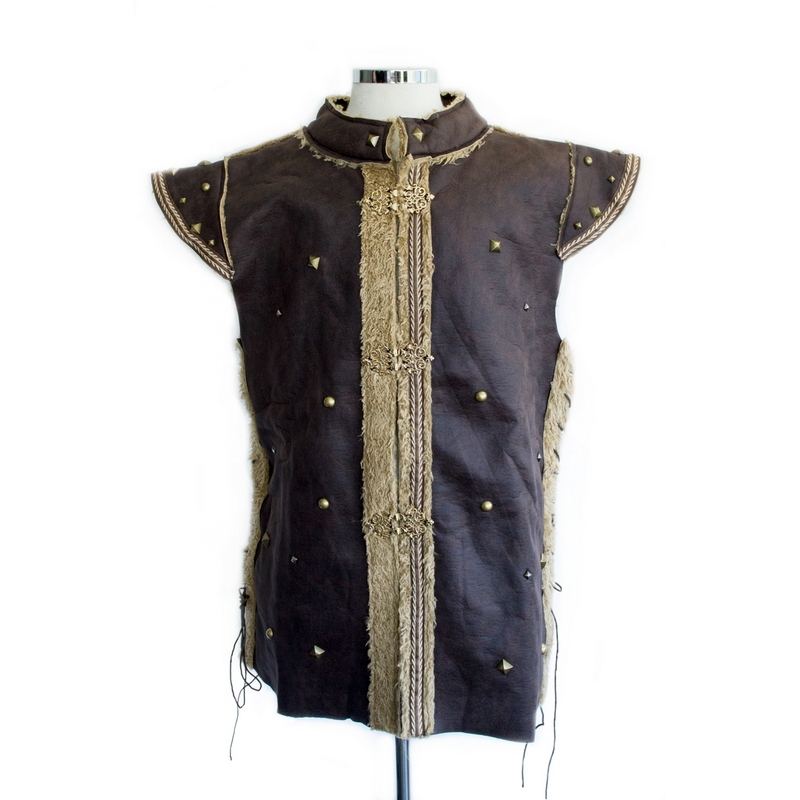 32" inches length from shoulder, 20" inches width across shoulders, adjustable width across chest and waist. Faux leather gilet lined with faux sheepskin. Both warm and attractive, this gilet features silver-coloured stud detailing on the body and sleeves, decorative metal clasp fastenings, and adjustable laced sides. This versatile tailored faux leather jacket. Featuring a stand up collar and studded V shaped front. It has a slight flare from the waist to create a flattering shape but still fits up to size XL. Fleece lining and stitched detailing, this jacket has plenty of character while still being appropriate for almost any setting. A patchwork of faux leather and sheepskin effect, designed to give a distinctive look to any character. It can be done up at the front with a lace cord, or left open. The flare at the back and bigger arm holes will give you a large range of movement when adventuring. Chest 52", sleeve 27", neck 20" (fully fastened), length 23", shoulder 21".